Not much to say about this second film from Seth MacFarlane about the come-to-life teddy bear Ted other than if you like crude humor you'll enjoy it. Not nearly as enjoyable as the first, this feels like a Muppet Movie ripoff with foul language thrown in. There a LOT of cameo appearances, which is probably the best part of the whole movie, so keep your eyes out. 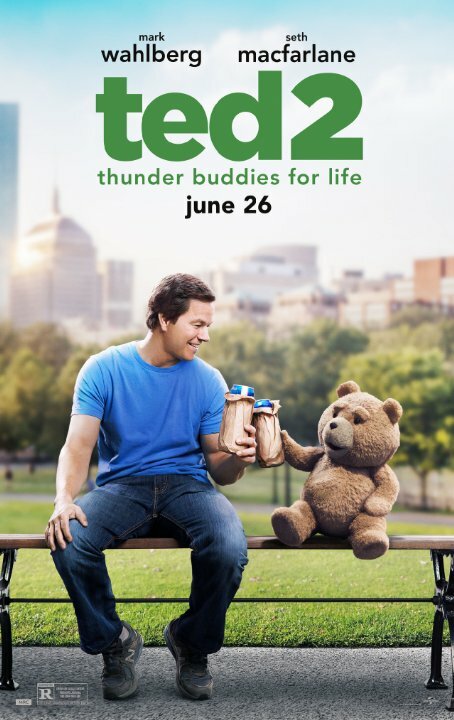 If you liked the original Ted, chances are you will also enjoy Ted 2. It's more of the same - if you know about the type of humor Seth MacFarlane uses, it's pretty much on par with his other films. Granted, I think he took an easy path - most of the humor is either A) about pot B) recycled from Family Guy or C) bagging on race/gay issues. I found it fell a bit flat at times, but was made up for by some killer cameos and an absolutely terrific showdown set at Comic Con. Ted is back with his filthy mouth and cute face. And this time he is better than before. Yes this installment is better than the original. This time the focus is completely on Ted and his life. The one-liners are excellent and the jokes are cruelly hilarious. The cameos by Jay Leno, Liam Neeson are brilliantly done and placement in the movie is well thought. Ted� s life is outstandingly shown. It starts with a lovely scene of Ted marrying his sweetheart Tami-Lynn and soon the reality strikes. Ted is on the verge of breakup so both decide to have a baby. So for obvious reasons they go for artificial insemination. What follows next is roller-coaster ride of cruel jokes, insults and abuses which are which are mind-blowingly hilarious. The story is about Ted and Tami-Lynn are married and the next step is having a baby but Ted can't be legally regarded as a parent unless he can prove his is "human" in a court of law. Now looking back on the first Ted movie I got say I changed my mind on it a bit and what I mean is that it wasn't as great as I remembered it to be, but I still think it's decent enough to give it a pass as a comedy and a film. But then I heard news about a squeal in the works and then I heard that Amanda Seyfried, Morgan Freeman and Liam Neeson was in the film and that alone give me a little interest in the movie just by that movie news. I wasn't jumping for excitement for this movie as I the movie didn't look anything special, just squeal bait. No posts have been made on this movie yet. Be the first to start talking about Ted 2!